A view of the solar eclipse that took place on July 22, 2009. The photograph was taken from Chennai, Tamil Nadu in India. A total eclipse of the sun wowed millions of skywatchers across India and China Wednesday. Solar eclipses occur when the moon gets directly between Earth and the sun, casting a shadow on a narrow swath of our planet. Day turns briefly to night. "The temperature dropped from 96.6 F to 88.5F at totality," said Donald Gardner on Spaceweather.com. Gardner watched the event from Huangshan. "The roosters were crowing and the streetlights came on!" The path of the eclipse began in India and crossed through Nepal, Bangladesh, Bhutan, Myanmar (Burma) and China. After leaving mainland Asia, the shadow crossed Japan's Ryukyu Islands and curved southeast through the Pacific Ocean. It was the longest total solar eclipse of the 21st century, and will not be surpassed in duration until June 13, 2132. Totality -- the phase of darkness when the sun is completely covered by the moon -- lasted for up to 6 minutes and 39 seconds. "On a remote Japanese island, bewildered cattle went to their feeding troughs thinking night had fallen," according to the Associated Press. "And in India, a woman was crushed as thousands of viewers crowded the banks of the Ganges for a glimpse." 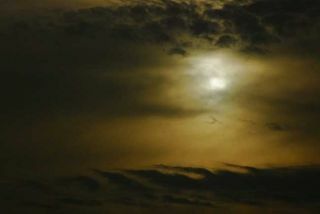 Spaceweather.com has a gallery of eclipse photos.